It’s not something you did that you can be proud of. Instead, we are God’s accomplishment, created in Christ Jesus to do good things. God planned for these good things to be the way that we live our lives. Everything about Haiti plays like a continuous loop from my head to heart. I memorize moments until everything about them is secure and I’m able to access them on demand. Bridging the gaps between trips, these memories sustain me and ease the ache of separation. On this day, I rejoice because right now, I am wholly here, filled up and ready to pour out. I’m part of the team that doesn’t make it to Jeremie on our first day in country. Staying behind at New Life Children’s home in Port Au Prince, I see God has accomplished much in Haiti since my first visit in 2010. Significant progress is all around. Open spaces create gaps where endless rows of tents once lined the littered landscape. The difference is recognizable; the movement forward is visible to those who have been here in the past. God’s handiwork surrounds us. What God is doing in Haiti is another one of His mighty works-in-progress. I give thanks He promises to complete whatever He starts and I am a witness to it in this country – right now. We drive along the streets to the airport and I’m wrecked by the wonder of God’s massive plan to restore His people. Oh how rich is the mercy of our Father’s vision, the unwavering intentionality of Jesus’ mission, and the power of the Holy Spirit that equips us to do even greater things than He did. Things continue to not work out as we had planned for the day, but we choose to not be discouraged by it. We know we are in on THE plan and each of us here has a role in it. He is at work through us, advancing what He has already determined to do. Our mission team represents 27 willing hearts, in this place, on assignment, and everything we do right now – matters in God’s holy scheme. Because of His deliberate purpose, I sense the indescribable measure of love and grace that covers me. We finally make it to the guesthouse and connect with the rest of our team. We give thanks for safety, provision, and beds without bugs. Sometimes days in this life are hard. The events and news they hold test us. But no matter how difficult, it’s impossible for them to exist beyond the reach of God’s grace. I’m emotionally tender and eager to go and be with the children in Lundy. The truck makes it up and hill and I immediately see my little Sania in a pink and white dress, which is slightly torn, and a tad too big. I lift her into my arms as soon as I step off the bus. 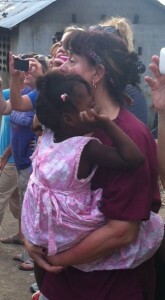 She softly sings Jesus Loves Me in her sweet and broken English. I sing along and the power of the words and the smile on her face break me to the core. Is it even possible to experience more love and grace than this? Cheek to cheek I point to the features of the ocean and sky. Sania points to them, too and giggles. A perfectly timed breeze surprises and cools us. We breathe in and out. I whisper in her ear that Dale is here, too. She lights up and quickly looks around the crowd. I point him out to her. She excitedly wiggles free and I watch her run towards him. Both arms sky high, she shouts his name and leaps into his arms. He positions her in the rightful spot on top of his shoulders. Now that she’s on top of the world, I watch Sania carefully position Dale’s sunglasses on her tiny face. It’s lovely, precious, and as it should be. I am aware how sacred this moment is to me. There’s no claim, boasting, or warranted behavior that’s earned the right for me to experience it. It’s the gift of God’s beloved Son that claims absolute credit for making everything about it possible. I recognize I’m not designed to fully comprehend, solve or judge the mystery of God’s timing and what He chooses to do or not do. His ways are not mine – they are higher. They are best. I trust in Him with all that is within me. Perfect, holy, and true, I ask Him to keep me synchronized with Him – whatever it means, whatever the cost. And so here I am in Jeremie, Haiti. I share this trip with my beloved husband, daughter, Zoe, and the remarkable mission team He assembled for this week. My arms are full and my heart is fuller. God planned for these good things to be the way I live my life. Thank you Lord for everything You are accomplishing, right now. Overly joyous. Overly wrecked. Overly Amazing God. Such a beautifully whole hearted written expression beloved friend. Thanks Melinda – you know this passion and love as deeply as I do. One day – we go together.